Floating offshore wind could be a credible, cost-effective form of low-carbon energy for the UK by the mid-2020's, the Energy Technologies Institute (ETI) has claimed. In a new report, the ETI said that continued technology upgrades and supply chain developments meant that floating turbines could deliver a levelised cost of energy (LCOE) of less than £85/MWh in 10 years’ time. Report author Stuart Bradley said: “UK wind resources are abundant and are already being exploited, with the country having the world’s highest offshore wind capacity. Developing floating technology can provide access to additional high quality wind resources in deeper waters, relatively close to the UK shoreline and near centres of population which will help bring costs down further. “In water depths of less than 30 metres, traditional fixed foundations will be the prime solution, but, in water depths over 50 metres, floating foundations provide the lowest cost solution so a mix of these technologies is likely to offer the lowest cost pathway to deliver mass deployment in UK waters." The current LCOE for floating wind is around £140/MWh compared to around £110 for standard offshore wind. The global LCOE for onshore wind dropped to around £60/MWh this year, according to Bloomberg New Energy Finance. Floating offshore wind technology can open up new commercially exploitable sites in deeper water that are currently inaccessible due to limitations in the depth to which fixed foundations can be deployed. Floating turbines are also much cheaper and easier to install, as they can be literally towed into position and anchored in a day. However the platforms and mountings are currently significantly more expensive than traditional rivals. 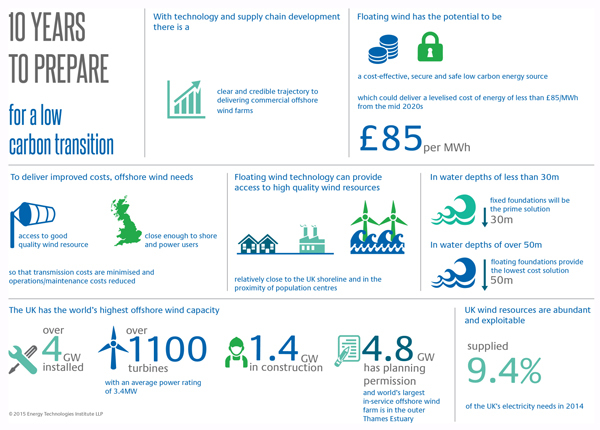 To help reach the £85/MWh target, the ETI called for floating wind demonstration projects to be implemented in the UK before 2020. However, it is likely that the technology will need some form of policy or subsidy support to reach deployment in the UK. Last month, floating wind developer Hexicon told edie that England and Wales were not target markets thanks to the availability of shallow waters where cheaper traditional offshore wind could still be deployed. However Hexicon said that Scotland’s deep waters could suit the technology, as well as places like the west coast of the US, Japan and Taiwan.